It's our 57th anniversary for bringing original art to central Illinois and we want you to be a part of the celebration! As one of the oldest art organizations in the country, the Peoria Art Guild Fine Art Fair is nationally recognized. We offer affordable hotel rates, convenient parking, and 500+ volunteers. This is the Peoria Art Guild's major fundraising event of the year. All proceeds benefit the Art Guild's community outreach and programming. Thank You to all of our Sponsors for all they do to support this event! Note: The Peoria Park District requests that no animals be allowed unless for therapeutic or emotional support. Showcasing 130 nationally recognized artists who love Peoria! Original works of art will include jewelry, painting, ceramics, photography, digital art, printmaking, mixed media, metal, glass, wood, sculpture, fiber, leather, and wearable fiber. I BUY ART, a grassroots campaign started by Peoria-based textile company Collecture, will become the central theme of this year’s Peoria Fine Art Fair. I BUY ART was launched to reinforce a philosophy that the best way to support the arts is to buy art. 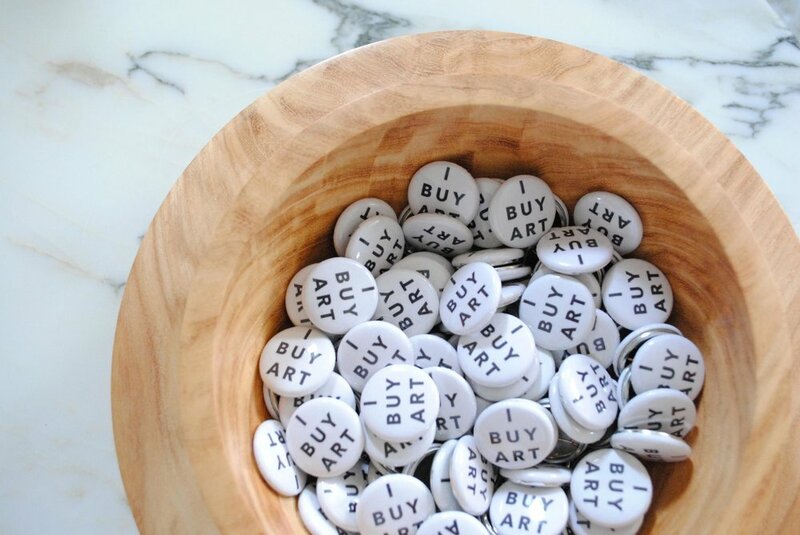 I BUY ART buttons will be given to every Fair patron that purchases artwork in an effort to advocate and emphasize the importance of buying original art. Shannon Cox & Kim Sanders, Directors of the Peoria Fine Art Fair are thrilled to be collaborating with Collecture to bring the I BUY ART initiative back to the 57th anniversary of this event. If you think the kids are the only ones having fun, the interactive CEFCU Community Mural is designed for adults. It takes hundreds of people to participate in this fun, hands-on activity — and everyone attending the Fair can watch as the mural literally comes together tile-by-tile over this three-day event. It's free, it's fun and it's Peoria's nod to our extremely talented poster artist John Leben. We are happy to announce the Kids Art Festival will include a community mural which will feature artists like Van Gogh and Kadinsky for our young artists this year! There will also be a large interactive canvas representing Jackson Pollock style of painting. Sculpture, textiles, watercolor and drawing activities will be included as well! On entering the fair, you can enjoy live musical selections throughout our scenic riverfront as a backdrop to your viewing and purchasing of the art on display. Exceptional palate-pleasers from some of Peoria's favorites will be available. Stay tuned for this years vendors. Selected red and white wines will be at two locations -- The Landing & under the Murray Baker Bridge. The best volunteers on the planet will answer all your questions about the Fine Art Fair, locating a specific artist, or directions to the Kids Art Festival. They can also tell you about upcoming special events. A fundraising raffle will also be at the PAG tent with current works from participating artists. And don't miss the official Fine Art Fair commemorative poster and T-shirts. They are a great, affordable way to support the Fine Art Fair.